When you choose TerraLam CLT mats, you can count on the reliability and performance that traditional timber mats just can't deliver. TerraLam mats are engineered to be lighter and last longer — helping keep your job on schedule and on budget. TerraLam mats weigh less, so you can fit more with every truckload — saving up to 50% on freight costs. TerraLam 300 (8’ x 14'): Fit 36 of these 14' mats in each truckload (288 LF), compared to just 20 bolted access mats of the same size (160 LF). TerraLam 504 (4’ x 16'): Fit 44 of these 16' mats in each truckload (176 LF), compared to just 18 of the 4'x16' timber mats (72 LF). TerraLam 508 (8’ x 16'): Fit 22 of these wider 16' mats in each truckload (176 LF), compared to just 18 of the 4'x16' timber mats (72 LF). TerraLam mats are designed to be installed faster, which can save up to 40% on labor and equipment costs. Innovative cross-grain technology allows TerraLam mats to last longer, even with heavy tracked equipment. For example, compare a TerraLam mat to a traditional lumber mat after an accelerated life test of 50 laps with a 44-ton bulldozer on a 22° angle. TerraLam mats help prevent puncture injuries, vehicle damage, and tripping and traffic hazards. They're built with renewable southern yellow pine to be more sustainable. 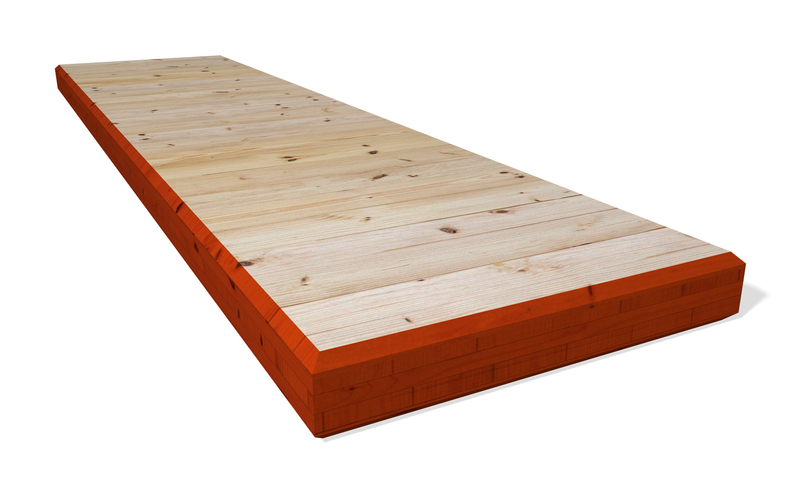 TerraLam cross laminated timber mats are available in 3- or 5-ply construction, with a variety of lengths and widths that fit your needs. Need a specific size? Just ask. 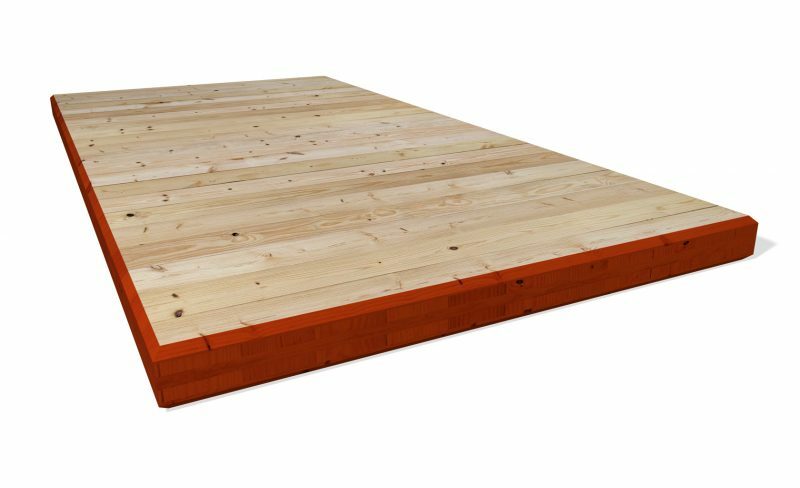 Bolted access mats and traditional timber mats are made with a variety of mixed hardwoods and softwoods, without consideration for lumber grade — resulting in inconsistency across mats. With an engineered cross laminated timber product, you can be assured that every mat delivered will perform to your specifications. We need mats that connect; is that possible with TerraLam? Currently TerraLam mats are available in 3- or 5-ply construction. The raw materials in TerraLam mats are farmed in approximately 20 years, where the hardwood species used in bolted mats can take 80-100 years to regrow. TerraLam mats have been tested successfully in temperatures as low as -70°F and as high as 150°F. While all wooden mats can be slippery in wet, muddy, and icy conditions, the solid top of TerraLam mats makes removing mud, snow, or ice much easier. Once TerraLam mats are traveled on, they become well-seasoned, mitigating slickness in challenging conditions. Since TerraLam mats are a solid block of wood, necessary repairs can be done easily and at less expense than with bolted access mats. Repairs to bolted mats often require removing rusted or bent bolts and fragmented boards. Damaged TerraLam mats are safer on the jobsite than a damaged bolted mat, as a damaged CLT mat does not expose crews to puncture injuries or equipment damage. Sterling prides itself in creating long-term relationships, not maximizing transactions. A Sterling expert will review your project and work with you to determine whether it’s best for your business to rent, lease, or buy TerraLam mats. TerraLam CLT mats are constructed with rapid-growth southern yellow pine #2 grade kiln-dried lumber, along with a moisture-activated polyurethane adhesive. The wood’s existing water helps cure the adhesive, creating an exceptional bond. Independent laboratories, including the USDA Forest Products Laboratory, San Diego State University, and Henkel Adhesives, have validated the strength and durability of TerraLam products. Ready to start your next project and find out how TerraLam can save you time and money? Contact us today for a quote.